Taken just after midnight Jan. 1st, 2010. This past weekend saw Rob and I celebrating 6 years of being together. We met for a coffee six years ago today. One coffee at Timothy's on the corner of Charles and Bay, and we've been together ever since. We spent the weekend doing something we came to love together, birding. Saturday we went to two different areas, Palgrave Conservation Area and Albion Hills, where we saw many chickadees, red breasted nuthatches and the surprise of the day, a wild turkey! 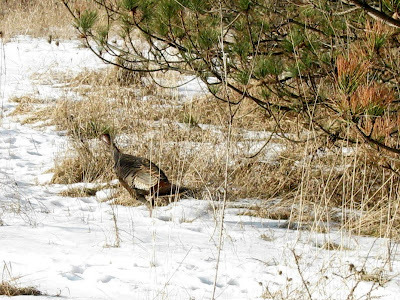 Rob caught this shot of a Female Wild Turkey running away from us. Today we went to a park closer to home, Jame's Gardens and had an enjoyable time watching the many woodpeckers in Lambton Woods, including a Red Bellied Woodpecker. We saw three Brown Creepers and quite a few White Breasted Nuthatches, which was special as we don't see them often. 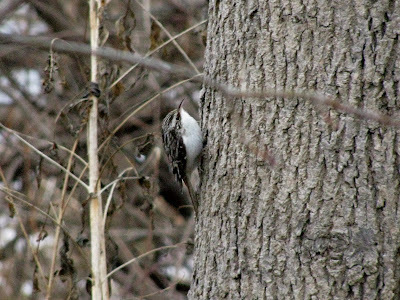 Rob took this great shot of the Brown Creeper. After birding today we went for a hot chocolate at Delight which was picked as one of the top ten places to go for hot chocolate in Toronto from blogTO. We had the "spicy", and it was delicious, and just what we needed to warm us up. We also bought a few truffles to enjoy tonight. Spending time with the one I love, doing stuff we love, doesn't get better then that! Happy Anniversary! Sounds like a great celebration! Happy anniversary, Angie & Rob! It's wonderful to be in love & doing things you love together! Here's to many, many more happy years. Great anniversary date, Rob & Angie! I wish you both the best always!